Originally commissioned for TTBB chorus by the Amarillo High School Bel Canto Chorale Men directed by Susan Hinrichs for the 2008 Honor Choir Performance at the Texas Music Educator's Association Convention (TMEA) in San Antonio, TX. It was composed in honor of those who gave their lives for our freedom and in memory of S/Sgt Andrew Caine Perkins, AHS Class of 1998, KIA March 5, 2007, Samarra, Iraq. A video of the Amarillo High School Bel Canto Chorale Men singing the original TTBB version can be found here. 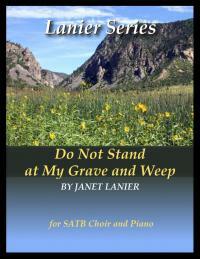 At the request of the Augusta Choral Society, it was revoiced to SATB in 2009. The text is freely based on a poem by Mary Frye, a Baltimore homemaker, who wrote this, her first poem, in 1932 to console her friend Margaret who was grieving the death of her mother. Margaret cried that she was not able to visit her mother's grave to say goodbye because she died in Germany during Hitler's powerful reign. The poem came to Mary while she was checking off a list of groceries so she gave it to Margaret written on a torn grocery sack. I am not there. I do not sleep. I am not there. I did not die.